PAST EVENTS - A look at what keeps our members busy! We had a very successful People's Choice Show this year. In addition to the usual People's Choice competition, we also had a category for Simi Valley Landmarks, which drew much interest. People's Choice: First Place - Kim Price "Sunset Half Dome"
Honorable Mention (tie) - Michelle McGrath "Koi Pond"
Simi Valley Landmarks: First Place - Michelle McGrath "White Face"
Honorable Mention - Terry Walson "Train Depot"
Honorable Mention - David Sgambellone "Corriganville Trees"
First Time Ever show by the Simi Valley Plein-Air Artist's Group. SVAA members had a wonderful time at the Simi Valley Street Fair. We had many people come by to see our displayed art works and vote for their favorite as the Peoples' Choice. Simi Valley mayor, Bob Huber, was gracious in helping us by also selecting a special Mayor's Award winner. This show is the highlight of the year for SVAA and its members. Presented at our Simi Valley Town Center Gallery, it is an opportunity for the community to enjoy art from artists throughout the Southern California area. 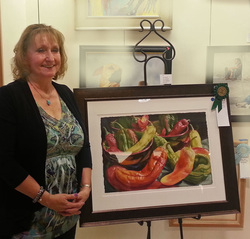 Sheri Jones with her Best of Show watercolor painting. Our very successful show in October 2013 had 130 entries in various media and was a real feast for the eyes. Our members exhibit their works of art at the Gallery. Over the weekend, the public votes on their favorite piece. 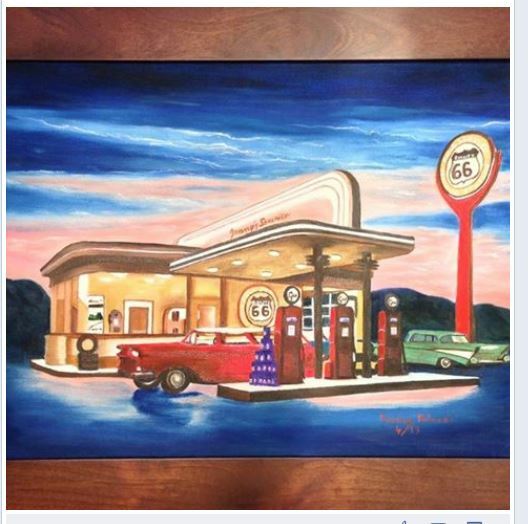 This year's winner was "Route 66" by Rosina Paluzzi. The SVAA Artists helped recreate chalk murals of Broadway musical play posters on the walls leading to the box office at the Simi Valley Cultural Arts Center (SVCAC). Strathearn Historical Park and Museum presented History Day with activities for all ages from 10 a.m. to 4 p.m. Sat., June 16 at the park, 137 Strathearn Place, behind Target on Tierra Rejada Road. SVAA Artists have been invited to set up an art walk and demonstrations at this annual event.. This event included: Antique Cars, Vintage Tractors, Vintage Farm Equipment Show, Ham Radio Demonstrations, Chumash Stories & Crafts, Blacksmith Horse Shoeing Demonstration, Crafty fun for big kids and little kids, Living History, Sewcranky, Yesteryears Dancers, Murphy's Flaw Band, Self-Tours of Historic Buildings. Click here to see photos from this event. 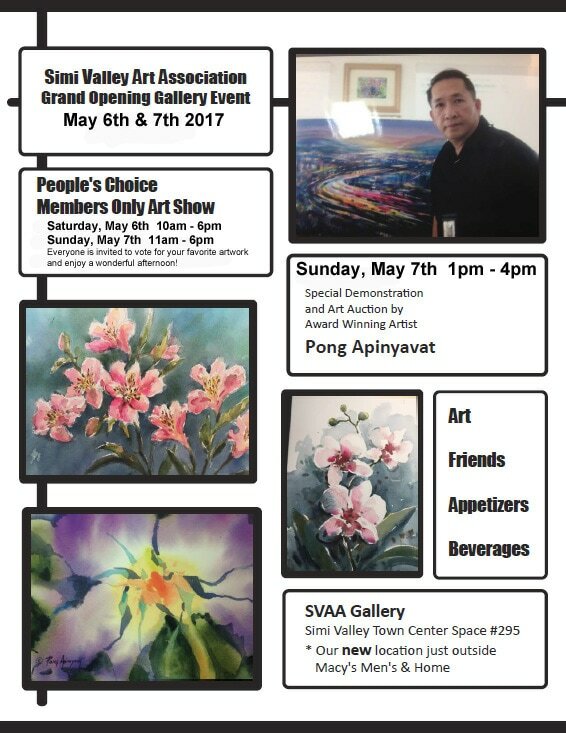 Simi Valley Art Association Inc. People’s Choice Award Show, an annual event for all SVAA painters, digital artists and photographers, this competition is being held at the Simi Valley Town Center Art Gallery on May 5 & 6. Entries are also welcome from non-Gallery SVAA participants. A special section for this event was created at the Gallery and the public was invited to vote for their favorite artwork. 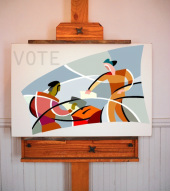 The public voted free of charge on these two days and casting a ballot entitled the voter to a free raffle ticket and a chance to win an artwork donated for the event. Awards were presented at the general meeting on Friday, May 18th. The show entries were on display at the SVAA Gallery through the end of the month. Click here for PCA News. Five hours long, the workshop hours are 10:00 AM-3:00 p.m. with a one-half hour break. There will be a short supply list and paper can be purchased in class for a supply fee. The workshop fee is $49 per person. The instructor, Rita Joyce, will share her techniques in wet-in-wet, dry brush and glazing. Rita has exhibited in over forty fine art galleries in the U.S., Japan and Hawaii as well as cruise ships auctions and galleries. She has been teaching classes for many years. Her approach is to create a fun and relaxed atmosphere where the artists can interact with each other and experiment with new ideas. SVAA has partnered again with The Village in showcasing fine arts. Open to members only, the Art Walk was held on Saturday, April 14, 10am – 5pm, at The Village at Dos Vientos Ranch, 330 Via Las Brisas, Thousand Oaks, CA. Annual Art Scholarship Competition at the Simi Valley Public Library Community Room. Graduating students from local high schools competed for over $1,000 in cash awards and prizes.